I really, really wanted to take a shower yesterday. Mostly because it's been warm here in Los Angeles lately, and I was starting to smell, but also because Chris and I went out last night and I thought it would be nice to be somewhat clean for our date. 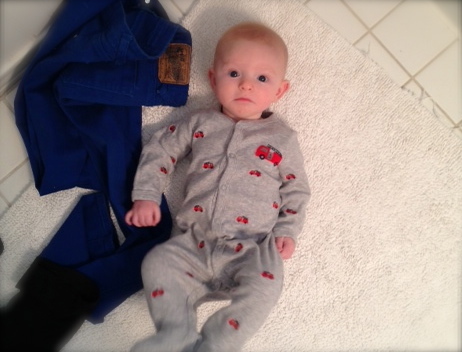 The problem is that my son doesn't keep to a schedule that allows me the time to take a shower on a daily basis. He takes naps, but they are usually so short that I only have time to feed myself before he wakes up. Due to the fact that we can barely afford ourselves, let alone a nanny, I don't have anyone to watch the kiddo while I do things like shower or grocery shop. So, at the point of desperation yesterday afternoon, I decided that I would simply bring the Muffin Man with me into the bathroom, put him down on the bath mat, and leave the shower curtain open so I could keep an eye on him while I (quickly) washed several days worth of spit up off myself. Feeling rather proud of myself for my ingenuity, I put Noah down on the (sort of) clean rug, gave him a toy to play with, and proceeded to hop in the shower. All went swimmingly until I had a head full of shampoo, which is when Noah decided to roll over. Up until this point, he's only rolled onto his side, but yesterday he flopped right over onto the cold, hard tile floor and conked his little forehead. He, of course, started screaming at the top of his lungs. I jumped out of the shower, sure that I had caused permanent brain damage to my child simply because I'm a vain woman who wanted to look cute for a dinner date. I picked him up and then ran downstairs to the kitchen to get a boo boo bear from the freezer to stop the giant goose egg that was developing on his tiny forehead. Keep in mind that I was naked, had shampoo in my eyes, and that all of the windows in my house were open to let in the spring weather. Thankfully, I've gotten my pre-pregnancy body (mostly) back, so at least my neighbors who got a free show were impressed with how good I look. Aside from a bruise on his forehead, Noah seems fine. But I'm pretty sure that's the last time I'll get to take a shower for a couple days.